Starting in July, the Warmis association opened their doors for us to attend one of their meetings. 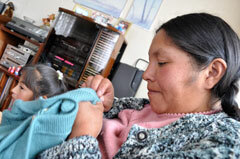 This happy group of women was organized a little more than a year ago after taking machine-knitting training classes at the Gregoria Apaza Center in the city of El Alto. 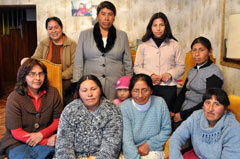 NS Warmis Association stands for the Aymara name Najrar Sartir Warminaka which means women moving forwarding. The group started with 18 people, but currently is made up of 8 women, the majority housewives with children. This time the meeting was held in the home of Doña Delina Fajardo and while they were conducting quality control tasks for their products, they answered our questions. The first we asked was “How did they get the idea of setting up their association?” The unanimous answer was they wanted to improve their household income mainly because of their children. Each of them works at home with her own manual knitting machine, and they get together fortnightly to coordinate their work. Now they sell their creations to Caserita and a shop in the southern part of the city of La Paz. In order to fulfill their orders they divide up the work and constantly rotate the products so that they all know the products and can make them at any time. Caserita: How did you organize the issue of capital? Eva: At the beginning, each one made a small contribution; then we borrowed from each other, but we have repaid everything now and the Association has its own capital. Caserita: Are all the designs exclusive? Eva: Yes. From the very beginning we decided not to copy to sell because there is a lot of competition nowadays. It didn’t make sense to do the same thing everybody else is doing. Caserita: Who designs the garments? Everyone: We make suggestions, and decide, but Eva designs the most. Caserita: What material do you use? Caserita: How many garments can you produce in a week? Eva: Each one can make two garments per day, or 10 a week, but that depends, because some garments have more detail work. Caserita: What is the “star” product, the one you sell the most? Everyone: The Mallku Poncho. It sells really well. Caserita: What do you see for the future? What is the Association’s next step? Eva: We hope that in the not too distant future to export more of our products ourselves. Now it is more difficult because there is a lot of competition, and the government doesn’t help you, so it’s not so easy to export these products. But we do want to export. Doly: We only need someone who can speak English. Maribel: This is how our meetings always go. We laugh and the time goes by. Caserita: Before attending the class, did you all know each other? 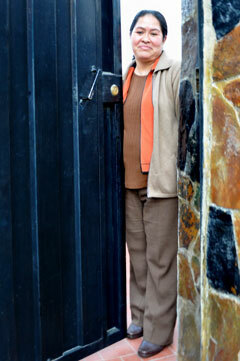 Maribel: We didn’t know each other, but we were almost neighbors… we just didn’t know each other. Everyone: We were at different levels in the class, but we all have finished the class and have come together. Caserita: How did you life change after learning machine knitting? 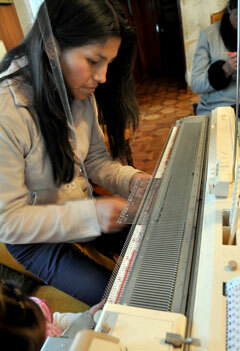 Maribel: I didn’t know anything, machine, knitting needles… nothing. Now I know. Everyone: Right, we didn’t know anything, but now we do. Knitting and knitting we have learned. They didn’t teach us everything in the class, but now we know. Caserita: How has your life changed becoming part of NS Warmis? Doly: It’s different now. I have my time, my place, my freedom. Everyone: Being part of the Association has changed all of us in different ways. We meet, we share, we work, we earn money and it’s going well for us. After taking some pictures and joking around a little more, we said goodbye to Warmis - Delina Fajardo, Bertha Chambi, Eva Callata, Clotilde Nina, Inés Fuertes, Doly Siñani, Rebeca Mayta and Maribel Nina - with the promise to return to share more of their experiences.